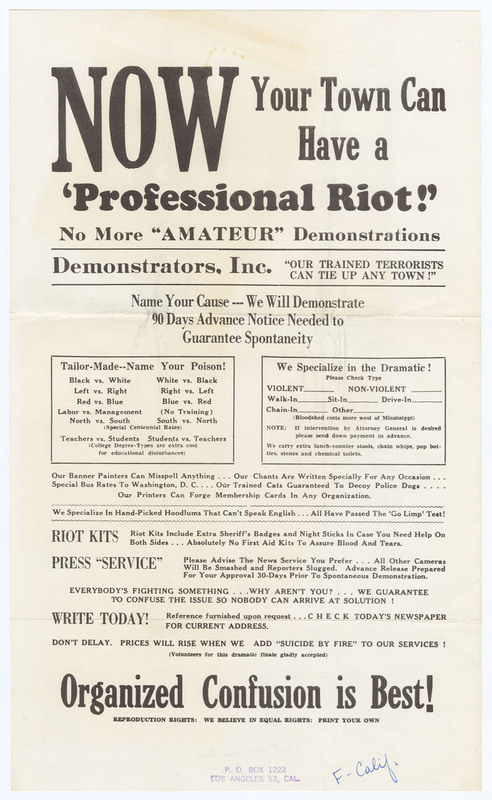 Now Your Town Can Have a 'Professional Riot!' Alert Americans Association, 1965. Dating to 1965, the Alert Americans Assocation's poster pictured here incisively expressed the derision that many conservatives felt for political protesters during the mid-1960s (see Go to College: Learn to Riot). 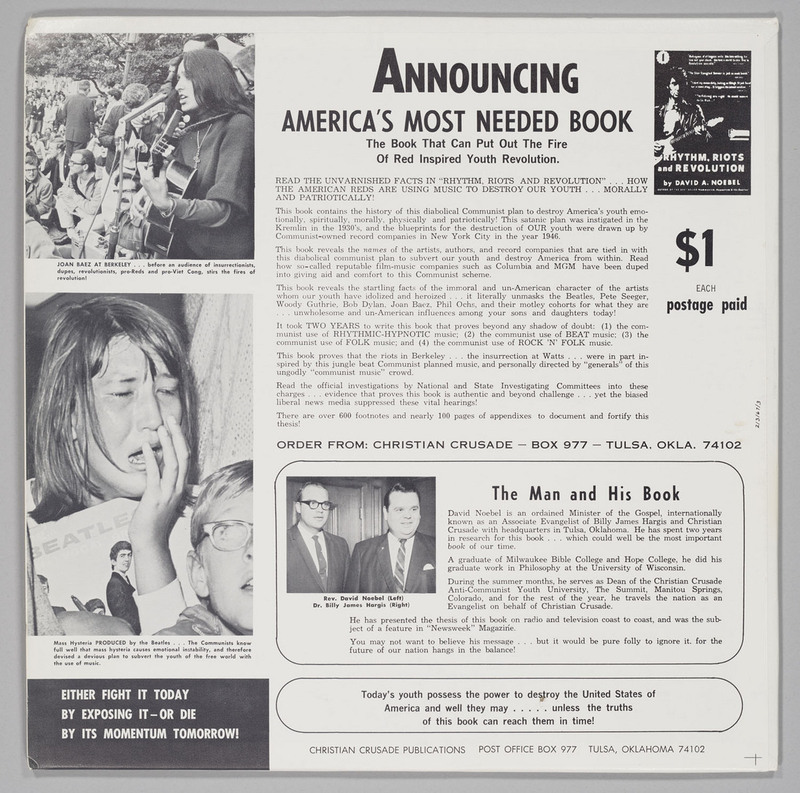 Distributed in California, the Berkeley Free Speech Movement of circa 1964-1965 may have been a direct influence (note that the mock order sheet lists that "college degree-types are extra cost for educational disturbances"), but the poster's designer seems to have had a host of other events on his or her mind. The note that "suicide by fire" will be added to their services seems likely to be a reference to pacifist Norman Morrison's self-immolation at the Pentagon in November 1965, while regional disputes, labor activism, and civil rights protests are all specifically mentioned. The satirical dismissal of these movements as the result of an unprincipled group of "professional" protesters who artificially inflated their own numbers betrays the belief that such radical movements were not only dangerous but failed to accurately represent the will of most Americans. In the specific context of the Vietnam War, Richard Nixon later similarly spoke of a vocal minority opposed to the "great silent majority" of patriotic Americans. Had Enough? Of the Student Radicals. . . . The Stop-NSA Committee of the Young Americans for Freedom, c. 1968. Created in 1947, the National Student Association's avowed purpose was to represent US students' collective interests in international conferences of student groups. Possibly funded in part by the Central Intelligence Agency from the very beginning, the NSA was fully controlled by the CIA by the early 1950s. With CIA direction, it served as one of many CIA front organizations that presented an anti-communist ideology in international political discourse and conferences. While the NSA's domestic politics were less-tightly controlled by the CIA, they generally adhered to socially liberal views--most notably voicing a strong opposition to segregated academic campuses. The combination of socially liberal policy and secret government funding amounted to political dynamite when the CIA's support of the NSA became public knowledge in 1967. While many on the political left were horrified by these disclosures (a string of college-level NSA groups quickly voted to leave the national organization), many on the right nevertheless seized on the CIA-student link as evidence in their ongoing campaign to assert that left-wing student activism was the result of a small group of cynical operatives seizing power by rabble-rousing. This cartoon illustrates the power of the NSA scandal to mobilize such forces on the right. In this case, conservatives came in the form of the Young Americans for Freedom. 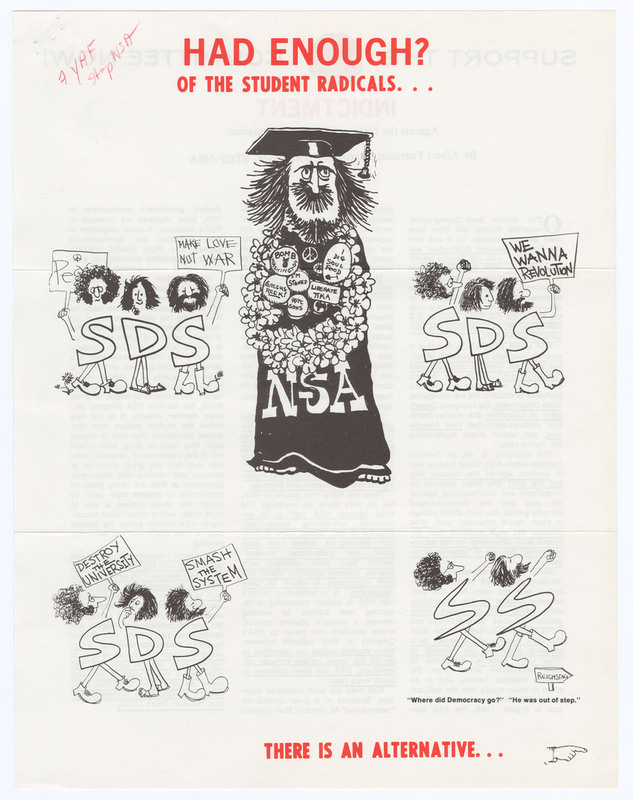 Growing out of a 1960 conference in Sharon, Connecticut, the YAF self-consciously positioned themselves as the conservative answer to the liberal Students for a Democratic Society, or SDS, parodied here as marching hippies. The message is that such student groups, like the CIA, were more concerned with gaining control over the US than with upholding American ideals--symbolized here by the transformation of the SDS into the "SS," the special police of the Nazi era. Man's Belief in God is Personal. American Economic Foundation, c. 1940s-1950s. 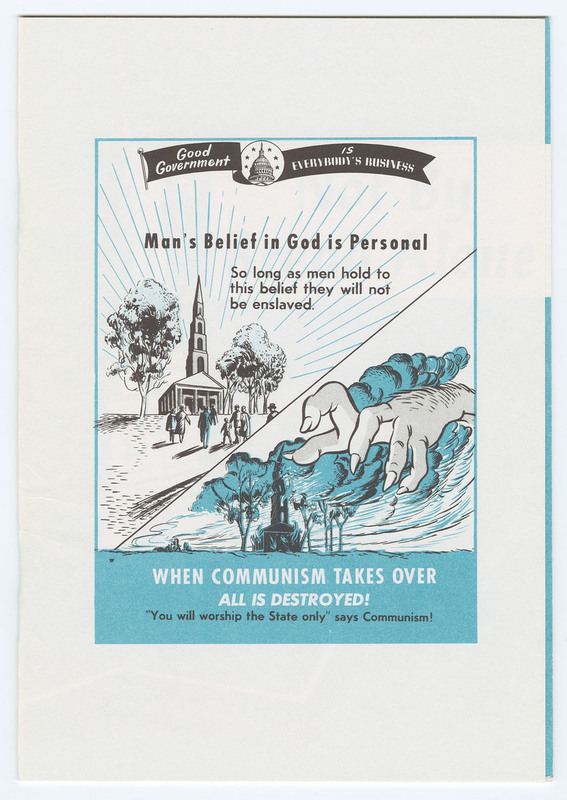 This image appeared on the inside back cover of Not By Bread Alone, a booklet that sought to unite religious faith with free-market economics, opposing communism by asserting "the economic value of morality." The hairy, long-nailed hand pictured in the bottom half of the drawing was an icon widely-used to represent the communist threat in the 1950s and 1960s, but it is a particularly fitting image for this pamphlet because of the contrast it makes with the equally iconic "invisible hand" of the free market. Whether intentional or not, such an idea would have been appreciated by the pamphlet’s author, Fred G. Clark. Clark was a businessman who made a vocation out of disseminating free-market views, through radio shows like his popular 1940’s program, Wake Up, America!, books like 1948’s How to Be Popular, Though Conservative, and the American Economic Foundation ("AEF"), which Clark created in 1939 to distribute materials like Not By Bread Alone to both individuals and corporations. In this pamphlet, Clark first asserted that the United States was the apotheosis of what he called the Christian "idea of the sovereignty of the individual." He then vaguely described "decades" of attacks on this belief, particularly from socialist and communist thinkers who pitted "faith in God vs. faith in the state." Ultimately, Clark’s solution to these problems lay in his "Ten Pillars of Economic Wisdom," a set of principles which formed the core of AEF ideology about unimpeded supply-and-demand economics and featured heavily in its publications. Christian Crusade litter bag. The Christian Crusade, date unknown. The Christian Crusade was the brainchild of Billy James Hargis, an ordained minister in the Disciples of Christ denomination. Hargis founded his avowedly anti-communist ministry and political action organization in 1950, demonstrating a keen knack for mixed media marketing from the very start as he frequently appeared on radio and television, lectured widely, released countless records, and published pamphlets and books. (For additional items that Hargis produced, see: For God and Country, Disarmament and the Phoenix Papers, and "The Marxist Minstrels," below.) Among his most famous publicity stunts, Hargis helped organize (on behalf of the International Council of Christian Churches) the release in West Germany of 100,000 balloons featuring printed Bible quotations that were intended to float into the Soviet-aligned nations behind the Iron Curtain, a project that ran from 1953 to 1958. As conduits for his evangelism, Hargis also founded the Tulsa, Oklahoma-based Church of the Christian Crusade and American Christian College, both of which provided him with a base from which to draw supporters for his political causes. The Marxist Minstrels. Christian Crusade Recordings, 1968. 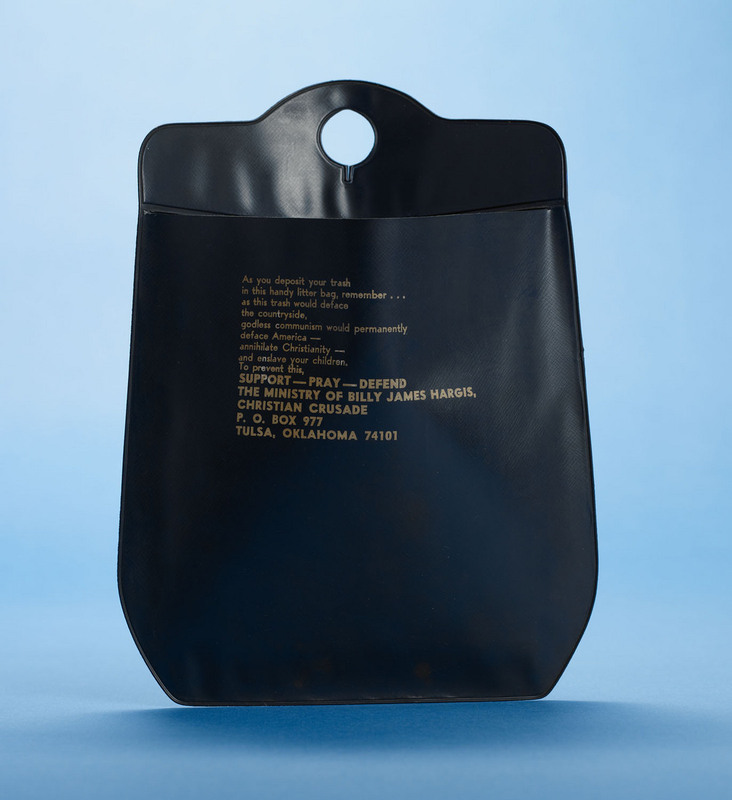 As director of the Christian Crusade (see "Christian Crusade litter bag," above, for more information), Billy James Hargis frequently repackaged material into several different media in order to spread his Christian anti-communist message as widely as possible. Such was the case with this LP from 1968, which consisted of David A. Noebel’s spoken ruminations on the theme of his 1966 book, Rhythm, Riots and Revolution. In the book and this record, Noebel (an associate minister with Christian Crusade, Inc.) asserted that pop artists as diverse as the Beatles and Woody Guthrie were part of a communist plot to corrupt American youth. (The fact that acts like the Beatles were not from the United States did not seem to phase Noebel as he criticized their "un-American" nature.) The front cover of this album plays with that notion by showing fuzzy, degraded musical notation in red, white, and blue. Jews. "Caffey"; Liberty Bell Publications, 1978. This image appeared on one side of a flyer of unknown provenance from circa 1978. The handwritten note from a Group Research, Inc., staff member in the upper right corner reads: "4-12-78 Put on car windshields in Georgetown". The other side of the flyer featured a photograph of Israeli Prime Minister David Ben-Gurion, with a lengthy quotation attributed to him in which he spoke favorably about the advent of world-wide government, among other future reforms. Also included is a brief advertisement for anti-Semitic tracts such as Henry Ford’s The International Jew and the Protocols of the Elders of Zion, available from Liberty Bell Publications. It is possible that this flyer was intended as an advertising leaflet for that Reedy, West Virginia-based publishing house. The film poster which this cartoon references is from 1975’s Jaws. 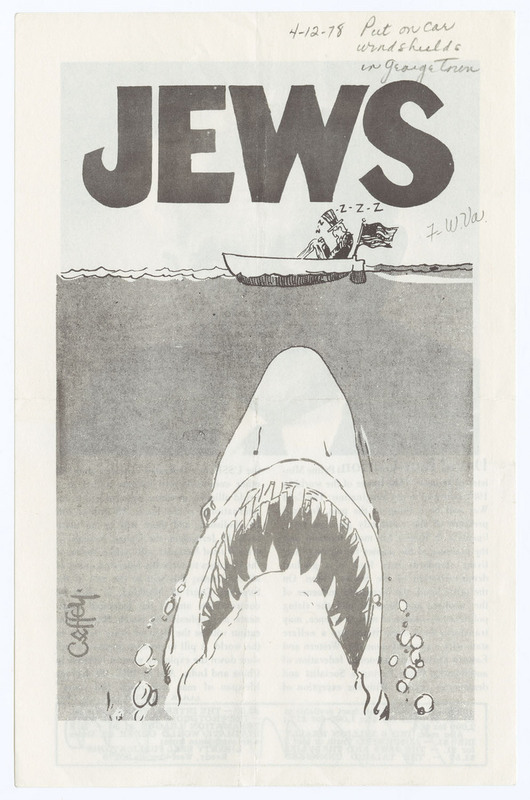 But its sequel, Jaws 2, opened in June 1978, and it's plausible that this flyer’s creator used the cartoon in part to capitalize on the cultural recognition of advertising leading up to the sequel’s release. The Worst Horror on Earth. Citizens Councils of America, c. 1969. Citizens' Councils were part of a loosely-affiliated network of local white supremacist groups formed in the late 1950s and early 1960s to protest court decisions and legislation in favor of civil rights for African Americans. (See: Famous Quotations: Theodore G. Bilbo and Crime: Don't Let It Happen! for more information about Citizens Councils.) 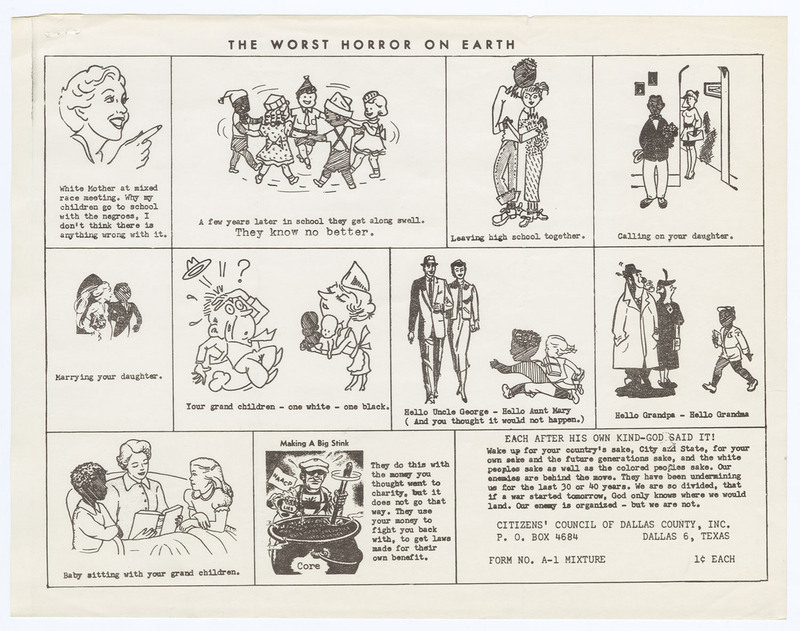 Propaganda such as this pictured flyer demonstrate one of their methods of affiliation: reproductions of the same cartoon appeared in Group Research files for organizations located in several different states but sharing a common goal. The cartoon's emphasis on the sexual effects of integration was fairly typical of the message most white supremacist groups propagated at the time. Note, however, that the fear of inter-racial sexual liasons was heightened and perhaps surpassed by one that those opposed to integration were too disorganized to do anything about it. As the creator of this flyer put it in the last panel: "We are so divided, that if a war started tomorrow, God only knows where we would land. Our enemy is organized--but we are not." The author of these words thus asserted his or her belief that the world should be strictly separated into only two camps, even while betraying the fact that it currently was not.